Collaborations are now a mainstay in fashion. It’s become the norm for brands to come together to create limited edition product to boost sales, and to heighten their cultural relevance. Sometimes these partnerships feel forced, and the product they collaborated on shows it. But when the right duo is formed, that’s when it can feel special.The ongoing collaboration between Uniqlo and renowned designer Christophe Lemaire takes the scalability and affordability of the fast fashion retailer and combines them with the simple yet sophisticated design language of Lemaire. Take a quick look at the Fall/Winter 2018 Uniqlo U lookbook and it immediately has the vibe of something that does not want to be associated with just basics. Clean lines, highly refined silhouettes and the right amount of colour in each outfit; this is the collection to be wearing if you want the look of a hip creative director but in reality, only have a ten dollar lunch budget. This is the collection to be wearing if you want the look of a hip creative director but in reality, only have a ten dollar lunch budget. It’s difficult to differentiate the Uniqlo U offerings from the rest of the collection. Only after you have queued to get into the change room and try the clothes on , does everything begin to make sense. This partnership has produced a collection of clothing that can be appreciated by everyone. They all draw the same conclusions; these pieces are worth having in your closet. Take, for example, the Milano ribbed crewneck. For the average Joe it’s just a nice looking sweater with a unique mock ribbed neckline that standouts. 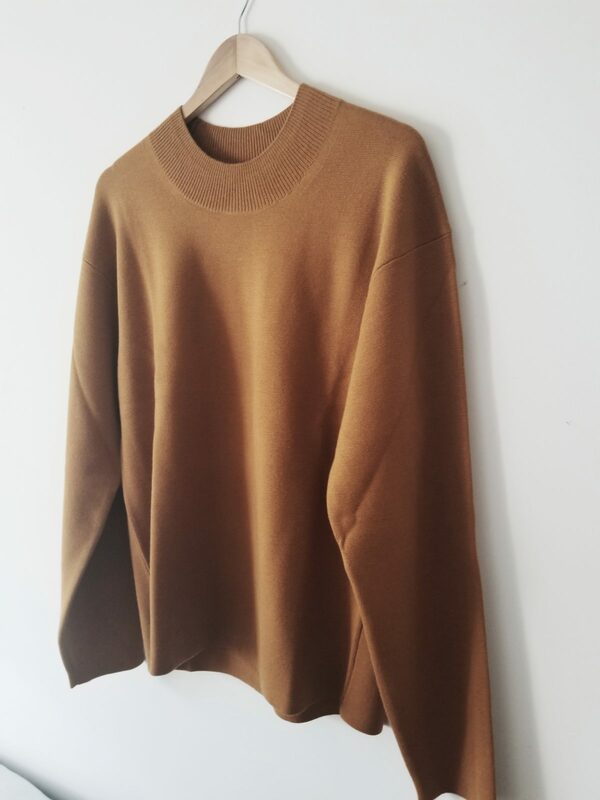 For the fashion enthusiasts, this is a handsome sweater with….MAJOR LEMAIRE VIBES. It has that quintessential slightly slouchy fit, and modern design details such as the current trendy dropped shoulder fashion dorks would nerd out on. Both the style noob and the geek might be purchasing this sweater for different reasons, but the outcome is the same; it will be worn, and won’t sit in your closet. This is what excites me about Uniqlo U. It’s a collaboration that is more about getting you into their clothing as opposed to just being happy you were able to purchase a piece. In a 2016 interview, Lemaire was quoted that his collaboration with Uniqlo was all about attempting to bring as much taste, smartness, functionality, and aesthetic qualities to everyday clothes. Now entering its third year, it’s easy to see all these qualities in one simple sweater.